Even if it’s free, you can always buy it cheaper. 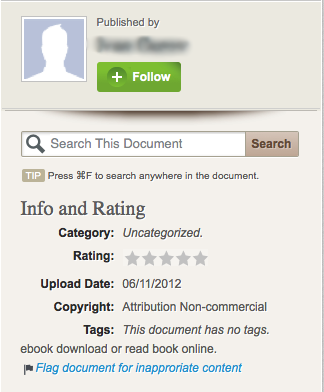 Document information at Scribd.com. Thievery is not flattery — done without my knowledge, claiming to be the publisher, and changing the copyright status … three absolute no-gos. The uploader did give the Copyright as “Attribution Non-commercial”, which it is not, it can be downloaded on this site but it is still copyrighted by me. The uploader did not inform me about it (if scribd was needed for whatever reason, I might have made it available there myself, I still might do, but under my own name). At least, the “publisher” did not edit the PDF and replaced my name so I have no reason to assume malice. Still, not very nice, esp. without telling me about it. Don’t take me wrong, I want my book to be read, to be available, to be shared. But I also want what every author wants: feedback. It was downloaded a hundred times at Scribd — this was feedback that I missed. And while I love the idea that someone might found it useful and am very happy if readers point their friends and colleagues to this book/site, uploading the book somewhere else goes to far. So, for all those who want to share it, please send the link to my download page — this gives me feedback when I look at the download statistics and other people the opportunity to look at the postings I wrote after I published the book. Categories: Book Information, Feedback, Organizing Creativity 2nd Ed.